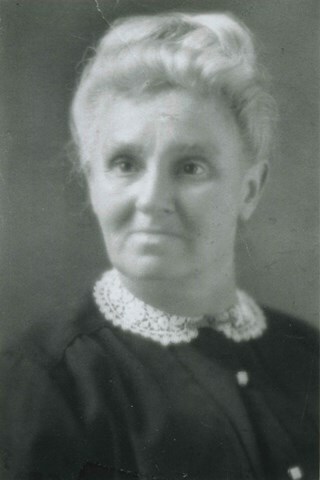 Photograph of Priscilla Amelia Rowling Byrne. 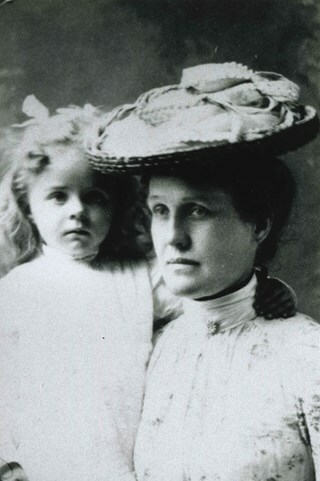 Photograph of Priscilla Byrne and her daughter Margaret. 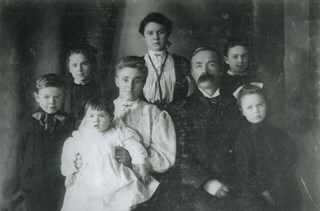 Photograph of the Byrne family seated and standing in two rows. Margaret is in the middle of the back row, standing between her twin sisters; Mary and Norah. Utan is standing in the front row beside his mother Priscilla who is seated with baby Elizabeth in her hands. Peter is on his wife's other side, with Kathleen beside him. Peter Byrne served as a member of Council from 1894 to 1895 and from 1898 to 1906. 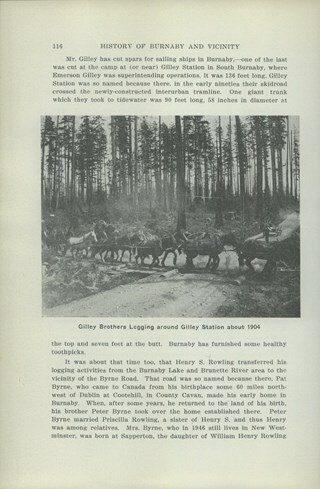 He was Reeve of Burnaby from 1906 to 1910. Virgin Mary and Jesus - Card. 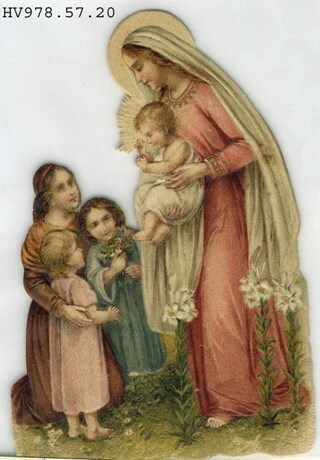 Cut-out paper coloured and embossed of Virgin Mary and Jesus with three children. Handwritten on the back is "Miss Norah Byrne"
From the estate of Norah Byrne, daughter of Peter Byrne and Priscilla Amelia Rowling Rowling. She married William Napoleon Descoteau on May 28th 1924 in New Westminster. William worked as a steam engineer on the railroad. Infant Jesus - Card. Religious card of an infant Jesus and flowers. 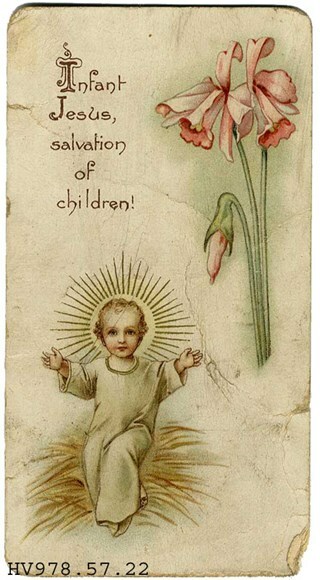 Above the image is "Infant Jesus salvation of children!" written in script. Autographs - Booklet -- . 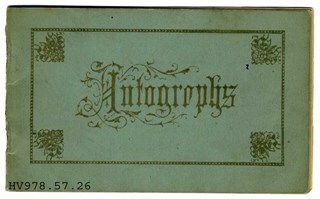 Small blue book for autographs that belonged to Norah Byrne. 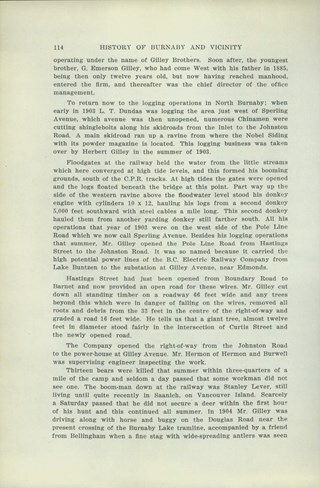 There are signatures dating from 1915 to 1932. Blessed are all - Card. 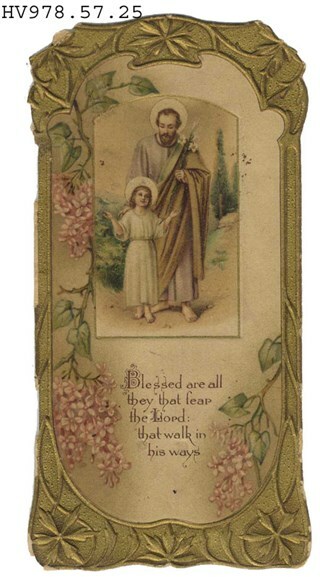 St. Joseph prayer card with an image of St. Joseph with a child Jesus on the front and "Blessed are all they that fear the Lord: that walk in his ways" written below. On the reverse is a passage from Psalms. What is Correct in Dress? - Booklet -- . 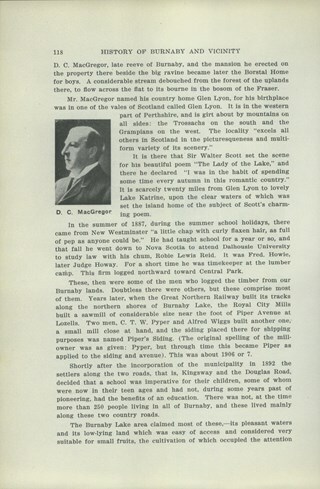 Small yellow booklet advertising Spring and Summer fashions for The House of Hobberlin Limited. 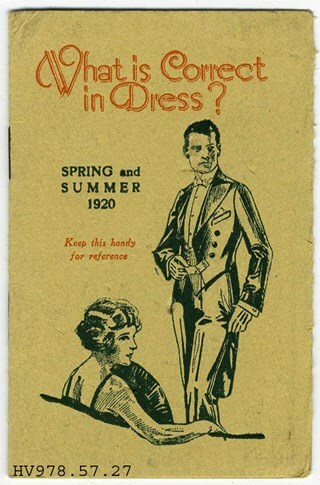 The booklet provides information on the Psychology of Clothes and the Correct Dress for All Occasions. 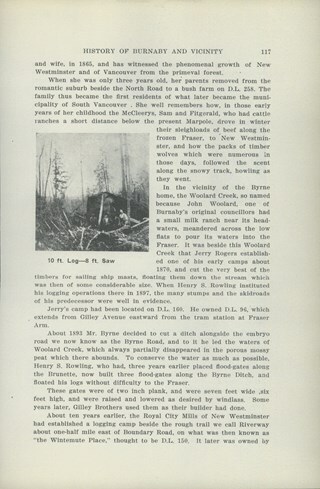 From the estate of Norah Byrne, daughter of Peter Byrne and Priscilla Amelia Rowling Rowling. She later married William Descoteau. Norah Byrne was born in 1896 and based on the era of the dress, it's possible that the dress originally belonged to her mother, Priscilla Amelia Rowling Byrne. 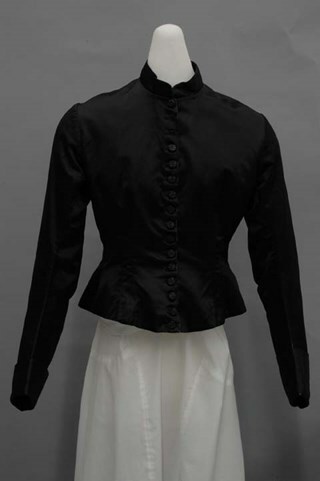 Mourning bodice, c.1884-1889. Black satin silk. High neck with collar, buttons down front, long sleeves with cuffs, basque bodice especially flared in the back. The bodice is entirely black, and unadorned except for the buttons and cuffs. The centre front closure has sixteen black jet buttons with a pattern cut into each. At the ends of the somewhat fitted sleeves there are four inch turned back cuffs. At the high neck, there is a mandarin collar. Inside, the bodice is lined with brown cotton. Five bones are evenly spaced along the six back panels and two front panels, with two darts each. The back section of the bodice below the waistline is flared out to fit over a bustle. Emmanuel - Card. Christmas greeting with a coloured picture of Virgin Mary and infant Jesus with flowers infront of a wall with three windows with trees visible through them. At the bottom of the card "EMMANUEL." is written in red script. Down the left side of card is "EXULTAVIT SPIRITUS", down right side is "MEUSINDEOSALUTARIMEO". 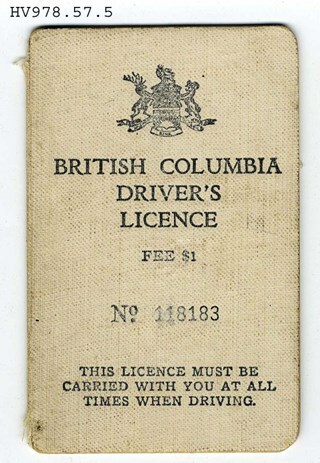 On reverse is "With CHRISTMAS Greeting"
British Columbia Driver's Licence -(License) -- . Driver's Licence issued to Norah Irene Descoteau in 1927. The front cover has the Provincial Coat of Arms and the issue number for the licence "No. 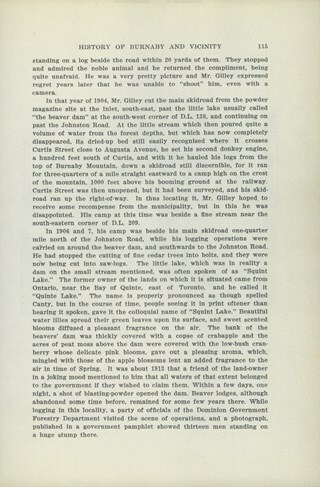 118183". It states that "The Licence Must Be Carried With You At All Times When Driving". 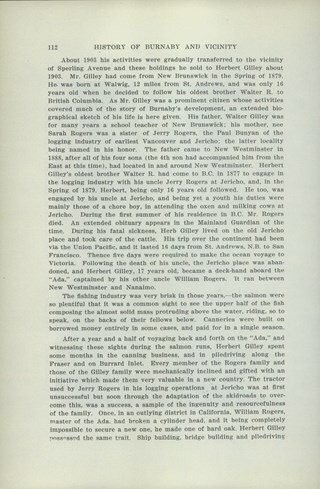 Inside provides detailed infromation about Norah and rules and regulations to driving. 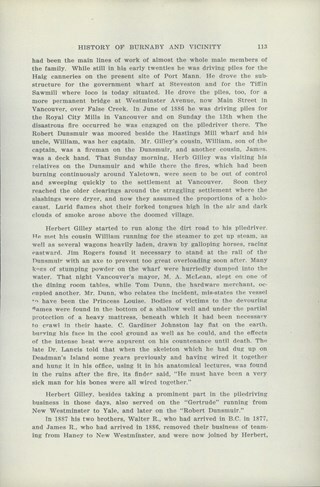 The license has been stamped by the Provincial Police in New Westminster, B.C.